Bed prep: Prepare beds by adding compost at 1/3 of volume, a handful of dried molasses, and SROF at 1 cup per square foot for new beds, and 1/2 cup per square foot between crop rotations. Mix well. Planting: Transplants should be set at the same depth as the top of the root ball. Cabbage can be direct seeded. Seed thickly and transplant once sufficient size has been attained. Thinnings can be used as a potherb. Watering: Keep evenly moist after transplanting. Once or twice a week without sufficient rainfall. Aftercare: Keep bed free of weeds – mulch. Watch for disease or pests. Side dress with 1/2 cup SROF per plant when heads begin to form. Harvest: The head should be tight and firm. Harvest by cutting at the base of the head with a sharp knife. Do not leave cabbage in the garden for a long time after it is ready to harvest as it will deteriorate or bolt. If the head splits or cracks, harvest immediately and use soon after harvest. If space and weather permit, you can leave the cabbage plant in place. It will produce a few small sprouts where the large outer leaves meet the stem. These will form small cabbage heads that can be harvested when they are firm. Additional Information: A head of cabbage is a spherical cluster of immature leaves. History: Cabbage was domesticated from the wild Brassicas, which were known to the Celts as early as 1000 BC. Heading cabbage was known to the Romans and Greeks and spread widely across Europe. Many varieties were developed in Germany, including the Savoy cabbage. 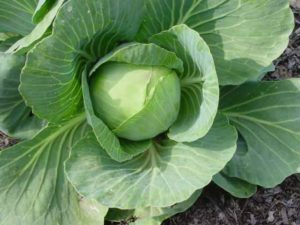 Cabbage was brought to the New World in 1541-1542 and was grown by the colonists and soon thereafter by Native Americans.